For the 13th of April 2017. From our great friend, survivor Leslie Meisels, to his fellow survivors and his liberators. He sends a version every year on the anniversary of the liberation of the Train near Magdeburg, for the first time he is not able to address it to Frank Towers, who passed at the age of 99 on July 4th this past year. Liberators Carrol Walsh and George Gross previously passed in 2012, and 2009, respectively. Read more, here. 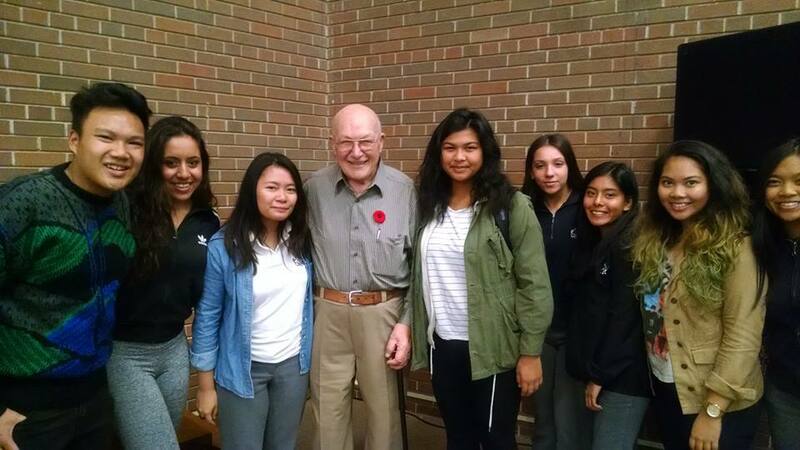 Holocaust survivor Leslie Meisels with Blessed Cardinal Newman Catholic High School students where they learned about reuniting Holocaust survivors with their American liberators, 11-7-2015. Photo by Joan Shapero. Hello again to all of you ‘my twins’ on our 72nd birthday! This’ birthday’ wish goes with a heavy heart because the loved, respected and admired by all of us—liberator Frank Towers—the last living liberator of those whom we met at the 2009 symposium – has left us. While he is not with us anymore, the memory and gratefulness for him and all our other ‘angels of our life’ remain with us to the end of our lives, and with our children’s (who were not to be born!) our grandchildren’s, and all future generations to follow, for the fight and sacrifice they did by destroying the Nazi tyranny, and with that, they gave us back our lives. For all of you who are still around, I hope my good wishes find you in good health, both physical and mental. It is a blessing to be alive and being able to think back of that ‘special birthday’ of ours, April 13th 1945. With my original Birthday on Feb.20th I turned 90 years old. My children grandchildren and friends made it a non-ending celebration. To be honest I enjoyed it very much. I never knew that being 90 years old means so much joy. I am still continuing strongly with Holocaust education and make the same message clear all the time; that government-sponsored and organized hatred is what brought on the Holocaust, and the silence of the majority allowed it to happen. Therefore, urge anybody who listens—never let hatred be part of their life, and never stay silent when they hear, see, or experience any prejudice or discrimination. Also remind anybody what George Santayana said—“Those who cannot remember the past are condemned to repeat it.” To remember we must, and we do. Again all my best wishes and happy 72nd birthday to all of you! Thanks again, Matt, for keeping the Holocaust relevant and on people’s minds. We cannot forget. Wonderful words, Leslie. Happy birthday to you and everyone else celebrating their special 72nd birthday of renewal. Matt, thank you for sharing them with everyone on your post. And thanks for the acknowledgement of the photo. Both of you please keep on doing what you are doing! Hope you had a happy Passover and Easter.